A day after NASA's Mars rover Curiosity drilled the first sample-collection hole into a rock on Mars, the rover's Chemistry and Camera (ChemCam) instrument shot laser pulses into the fresh rock powder that the drilling generated. This scene shows a line of pits left by laser hits on the drill tailings. The view is an annotated mosaic of images taken by the remote micro-imager in ChemCam, with color information from Curiosity's Mast Camera. The drilled hole, at lower center, is about 0.6 inch (1.6 centimeters) in diameter. 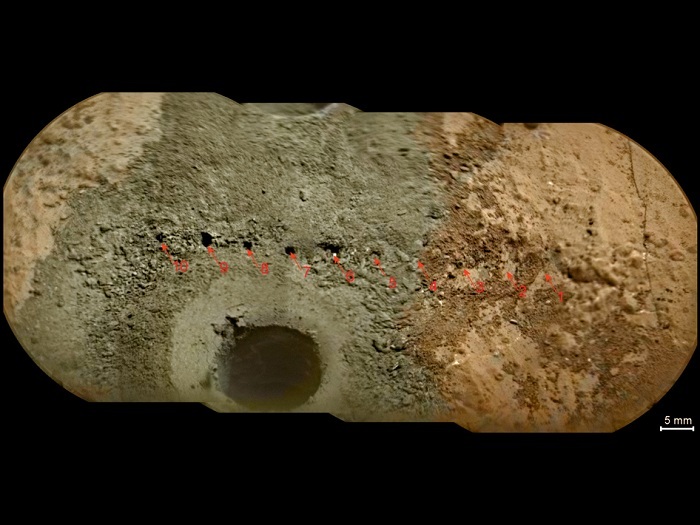 Curiosity drilled the hole 2.5 inches (6.4 centimeters) deep during the 182nd Martian day, or sol, of the rover's work on Mars (Feb. 8, 2013). ChemCam repeatedly zapped several points near the hole on Sol 183 (Feb. 9, 2013) to obtain spectra providing information about composition, and then on the same sol took the images that have been combined to create this view. Arrows at 10 locations indicate the marks from the laser hits. The site is on a patch of flat rock called "John Klein" in the "Yellowknife Bay" area of Mars' Gale Crater.